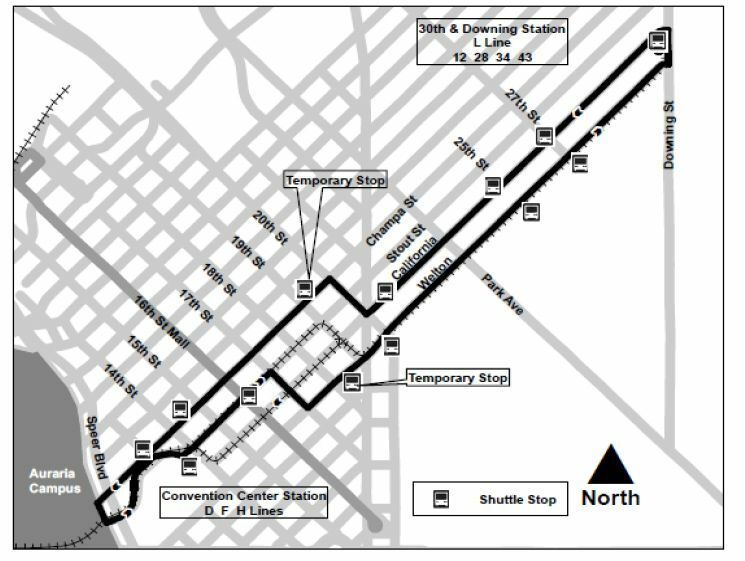 Due to replacement of the track and components associated with the agency’s original light rail lines in the downtown corridor, there will be no light rail service between 30th & Downing and Theatre District/Convention Center stations for ten days beginning Friday, September 14th, 8:00 pm until Monday, September 24th, 3:00 am. Bus shuttle service will be provided. Please allow extra travel time. The final stop for northbound D, F, and H light rail lines will be Theatre District/Convention Center station and all L line service will be suspended. Normal service will resume on September 24 at 3:01 a.m. Schedules and frequency for D, F, and H line arrivals and departures from Theatre District/Convention Center Station are unchanged, however there may be delays due to trains turning southbound from this location.